Big2 Pai Gow poker is a Chinese variant of poker game. This game is also known as Big Two, Big Deuce, or BigD, and is a popular poker game well known in East Asia and South East Asia especially throughout China, Indonesia, Macau, Hong Kong, Malaysia, Taiwan and Singapore. It is played both casually and as a gambling game. It is usually played with two to four players, the entire deck being dealt out in either case (or sometimes with only 13 cards per player, if there are less than four players). The objective of the game is to be the first to play of all of his cards. It is sometimes confused with tien len (a.k.a. thirteen); the two games differ primarily in that big two involves poker hands, while tien len does not. How to play Big2 Pai Gow Poker? There are numerous variations of the rules of Big2 Poker, but many versions of the game have a lot in common. The game uses a regular 52-card deck. 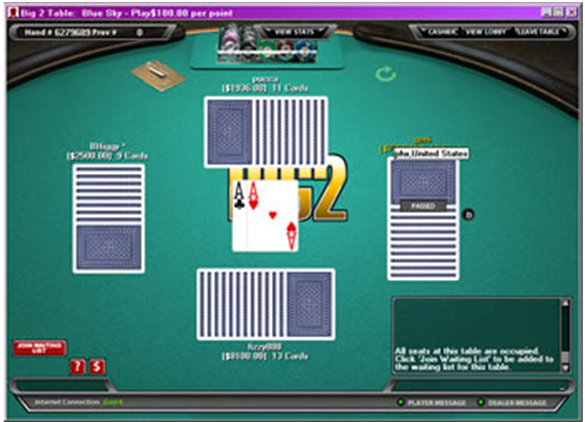 Each player is dealt a 13-card hand, with the entire deck being dealt out in a four player game. Cards are ranked slightly differently in Big2 than in most games. As the name of the game implies, twos are the highest ranking cards; aces are next, followed by kings, with the rest following as in standard card games. Suits are also ranked, with spades beating hearts, clubs and diamonds, in that order. The game begins with the player with the three of diamonds playing it, either as a single card or as part of a combination. Many different combinations are possible, including pairs, three of a kind, straights, flushes, full houses, four of a kind including a fifth card, as in a full poker hand, and straight flushes. After the first player plays their card or combination, each player going counter-clockwise must play a stronger hand using the same number of cards as the initial player. A player can also pass, either because they don’t wish to play a hand, or because they can’t. Once all players other than one have passed, the trick is over. The next trick begins with the last player to make a play starting, playing any single card or combination they wish. The game ends when any player runs out of cards. In many rules variations, ending with a single two or a pair of twos is not allowed. Scoring, like many rules in Big2, varies from game to game. However, the most common rule is for a player to receive -1 point for every card remaining in their hand. If they hold 10 or more cards at the end of a hand, they get -2 for each card, and if they haven’t played a single card, they lose -3. The player who won the hand by playing all of their cards receives points equal to the points lost by all other players. If a player receives a hand with only 3 points or less, s/he may declare his cards, and the cards shall be reshuffled and dealt again. Point counting rules: J=1, Q=2, K=3, A=4, 2=5, others=0. These point-counting rules may vary from place to place, or may be voided. A variation states that a player holding a hand with no cards with faces on them (namely Jacks “J”, Queens “Q”, and Kings “K”) may request a reshuffle and the cards shall be dealt again. If Player B won a game by playing her or his last card (the case of more than one card played is excluded) after Player A has played his or hers and Player A could have prevented this from happening by playing a higher card, s/he is deemed to have assisted Player B. There are several ways to penalize Player A. The most common way is for Player A to be deducted the total points that the other 2 losers have lost on top of her or his own so that the other two may win some points. This rule can vary between styles of play. If the scoring system is by ranks (e.g. who finishes first, second, third or last), then this rule doesn’t apply. 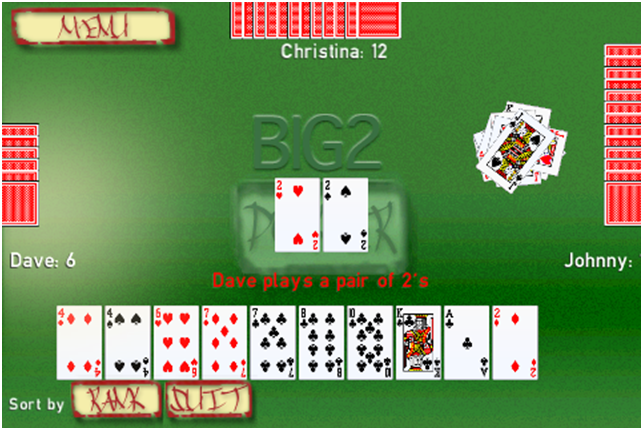 Some rules variations of Big2 allow a player to immediately win the game if they start with a “Dragon” – a 13-card straight with one card of each rank. In that case, all other players lose points for having not played any cards, and the winner receives the maximum possible number of points. 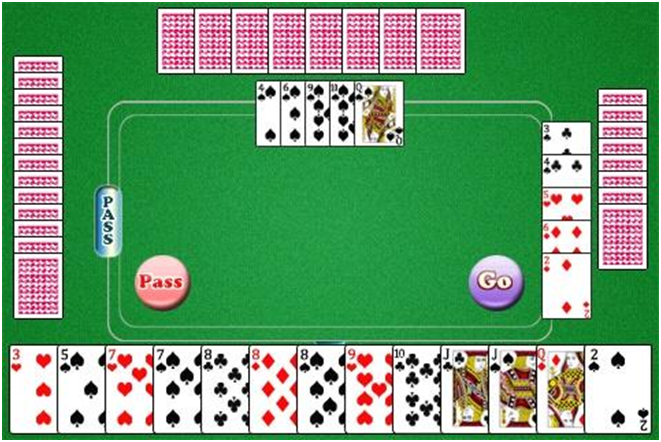 Some games allow players to ask for a reshuffle as said above by declaring a particularly poor hand. Often, this is permitted only with hands with a value of three points or less, using the following system: J=1, Q=2, K=3, A=4, deuces=5. Again, as with most Big2 rules, this one can vary from game to game. Given the extreme penalties faced for leaving too many cards in your hand, it’s important to realize when you need to play to win, and when it’s more important to play to stay out of trouble. The key points are getting at least one card out of your hand, and getting your 10th card out. The difference between being left with nine or ten cards is larger than the difference between being left with nine or just one! Gaining a feel for when you have a realistic chance to win a hand and when it’s best to simply cut your losses is critical to becoming a better Big2 player. You can enjoy this game at few land casinos and online casinos as well. There are many Big 2 Poker apps available at Google Play Store to enjoy the game free on your mobile before you indulge in real money poker play at real casinos.